A dispute between several Ashburton residents and Afrimat, the owners of a nearby quarry, has come to a head after some residents tried to open a case of illegal blasting against the company on Monday morning. About 20 residents of Ashburton living in the Lower Mpushini Valley parked their cars near the entrance to the quarry in Ashburton to protest against an alleged unscheduled blast. Police were called and monitored the situation. The community said they will open a case today, after compiling statements and a list of the transgressions. Residents claimed Afrimat had blasted on Monday morning without giving them proper notice. Afrimat Limited is an open pit mining company providing industrial minerals and construction materials. Community member Nick May said everyone living near the quarry has major cracks in their houses, allegedly caused by blasting over the years. May said there were also concerns for the environment, the wildlife and how the area would be rehabilitated at a later stage. But Afrimat on Monday denied the cracks were due to their operations there and blamed them on “substandard building skills”. “A blast was scheduled for 2 pm today [Monday]. But this morning at around 8.30 am the blast went off. The siren to warn us to stay clear of the area only sounded for about a minute, and the road was closed for about two minutes and then they blasted,” said May. He said the blast was supposed to away from buildings. “My home is about 150 metres away from the site and a few years ago, when they blasted, a large rock landed just six metres from my house. Another Ashburton resident, Maureen Hansen, said the cracks in her house started when Afrimat took over the quarry around 10 years ago. She said she has had to prop up the foundation at the one corner of her home after it was damaged due to the blasting. May said they had been at the quarry since Thursday in the hopes of engaging Afrimat, but that had not happened. He said there was a meeting on February 7 where Afrimat representatives agreed to stop the blasting until an investigation was done. 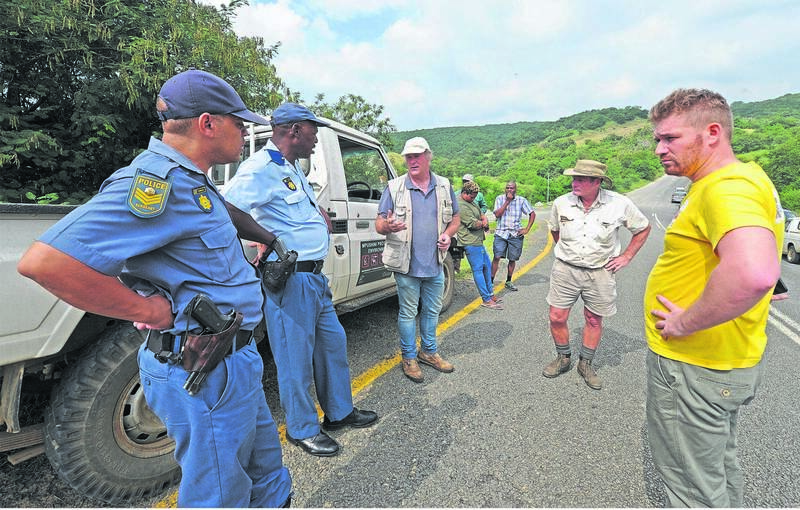 Lower Mpushini Valley Conservancy member and Preservation of the Mpushini Mkondeni Biodiversity Trust chairperson Pandora Long said she saw people starting to block off the road on Monday morning and asked the workers four times if they were going to blast. She said the workers said they were not. “I was driving away and the blast went off,” said Long. Lower Mpushini Valley Conservancy chairperson Keith Brown said as the chairperson of the conservancy, he had distanced himself from the issue as he did not agree with the course of action some of the community were taking. Afrimat director Andries van Heerden said the situation at Ashburton was “an unfortunate one”. “We pride ourselves on working with the community and that we do everything in a legal and ethical way,” he said. “The problems with blasting came before we took over the quarry in 2008 and recommissioned it in 2009. “From an engineering perspective, the impact of the blast diminishes the further it travels. Houses have to be really close to the site to experience cracks. It is completely impossible that the blasting caused the damage. He said they had paid various independent investigators to look into complaints and gave the reports to Pandora Long to see. He said they adhered to all legislation and have “very strict regulations”. He said the quarry had scheduled a blast last Thursday for 2 pm but because some residents were at the entrance of the quarry and would not move, they postponed the blasting to the next day for safety reasons. “On Friday the community was there again and would not leave so we had to postpone the blasting again. “The explosives had been charged up on Thursday and we could not let them sit any longer. It is unsafe. So on Monday, the staff ascertained that it was safe to set off the blast. We rang our siren for the required three minutes and complied and everyone was safe. “It is not our style to bully the community”. An Mpushini Valley source said they objected to some members of the community implying a unanimous decision was taken by this community to embark on this course of action.